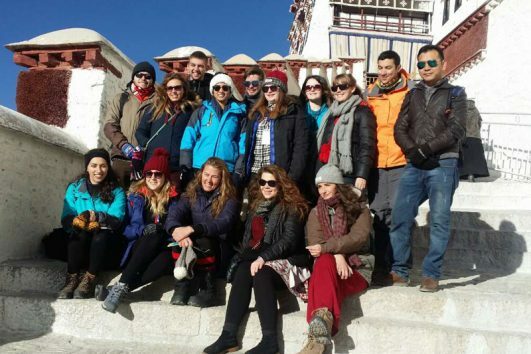 4 days Tibet Lhasa Group Tour will show you all highlight attractions in Lhasa. For example, they include Potala Palace, Jokhang Temple, Barkhor Street, Drepung Monastery and Sera Monastery. Because you need to acclimatize to plateau, you should have a good rest at the first night. And we will begin the group tour on the second day. The second day will contain the must-see attractions in Lhasa including Potala Palace, Jokhang Temple and Barkhor Street. And your Tibetan tour guide will tell you many Buddhism stories while your visiting. So you can learn a lot from their instructions. On the third day, we wil visit Drepung Monastery and Sera Monastery. They are famous Gelug monasteries. We will spend a few hours inside, so take your time and enjoy the religious atmosphere. The highlight moment in Sera Monastery is the monks’ dabate. They will challenge each other and exchange their ideas.